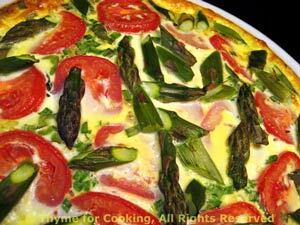 Thyme for Cooking Menus: Asparagus and Goat Cheese Quiche, easy recipes. This is a simple dinner for Saturday, as long as we're having big roast lamb on Sunday. The quiche is chock-a-block with vegetables, making a substantial dinner with very little meat... And very healthy... I know tomatoes aren't in season yet, but the supermarket ones are fine for this. Cook the rice earlier if you can.